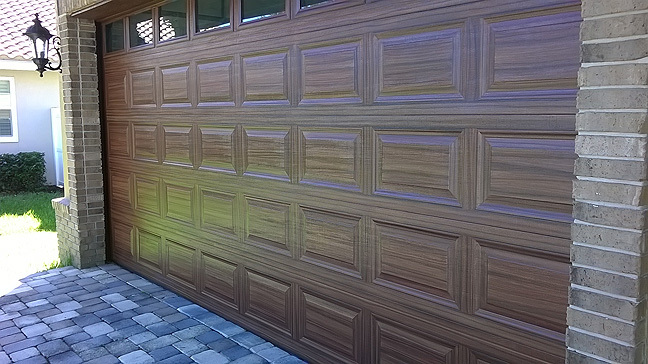 This week I finished up painting a garage door to look like wood. 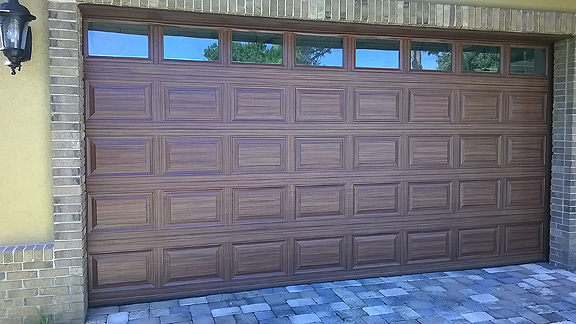 These doors are the over sized garage doors and by that I mean they are 5 rows high instead of the more common 4 rows high. 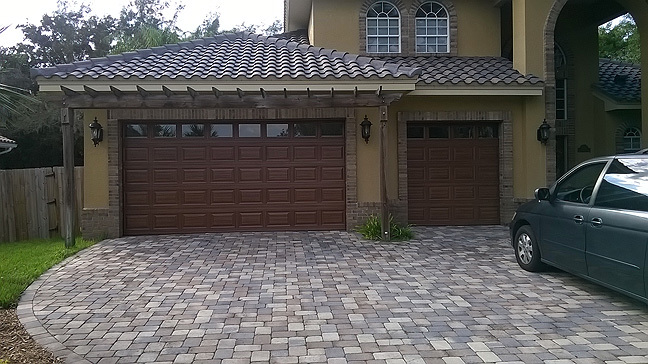 The single door on the right looks a little darker in the photo above but it's the same tone. It is just set back a few more feet and doesn't get the same light on it. I find that layout common and it always makes the door that is set back seem a little darker when I photograph them together. The next photo is a shot I took early in the day. 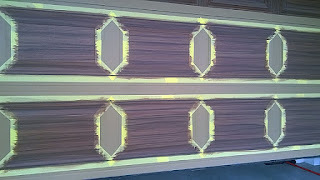 I had gotten the top part of the door done already. 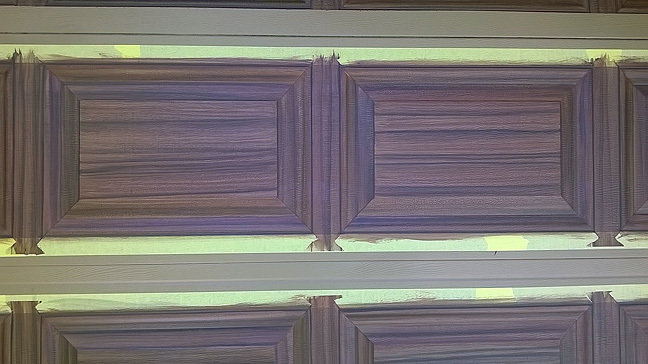 You can see the base coat of paint on the rest of the door. 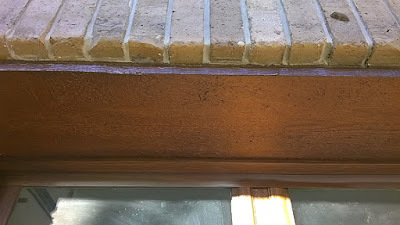 The base coat is a Sherwin Williams color called toasty. 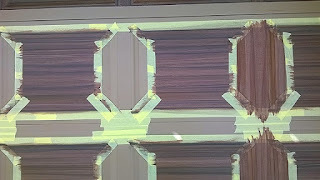 This photo shows the large trim piece of wood that is a header for the door opening. 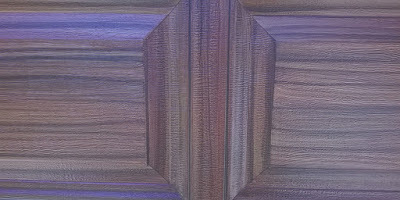 I painted that also and it was challenge because you can see how rough the wood is. Very rough and hard to get the brush to go across it smoothly but it came out great. You can see the header better in this next photo. 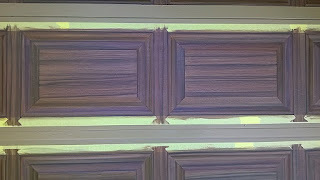 I was painted the color of the body of the house I decided it would look way better to have it painted like the door. 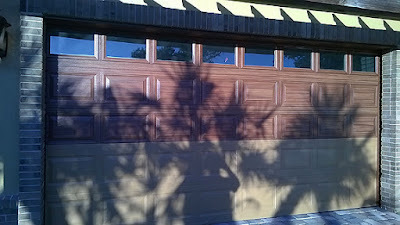 This next sequence of shots shows the steps involved in how I paint the garage door to look like wood. I use a lot of tape. I tape off the center panels like in the first photo. 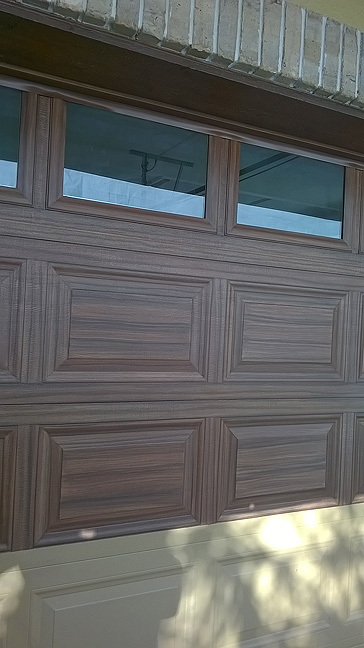 Then on this door I used a reddish brown color SW Fiery Brown for the first color of wood grain. 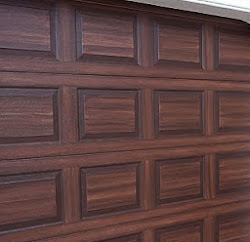 After that dries I used a SW color called Black Bean for the second color brown. 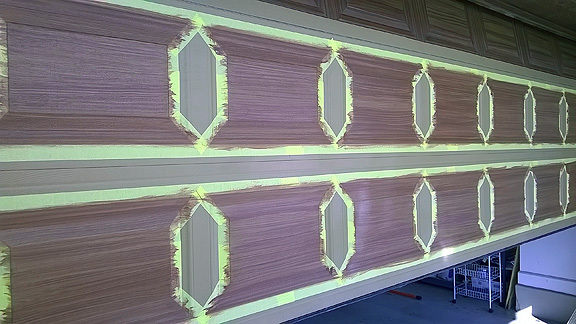 Once I get the center panels done I re-position the tape so I can paint the space between the center panels with a vertical wood grain. I paint the garage doors with a vertical wood grain in these areas because if the door where indeed made of real wood they would have a vertical wood grain there. 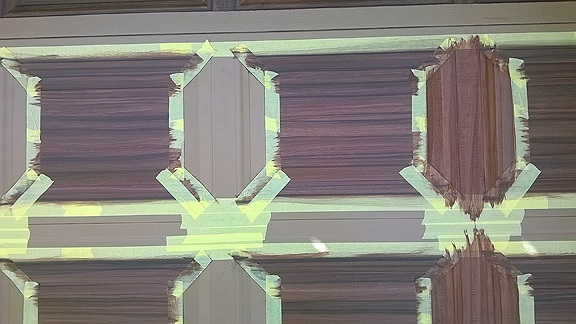 So this next photo shows how I have applied the first wood grain color on. The next shot shows how nice a row looks when I am finished with it. 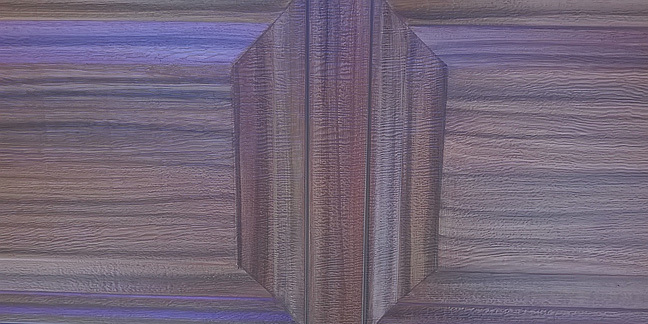 Here is a closer view of the wood grain pattern I am able to create by just painting with a standard paint brush. 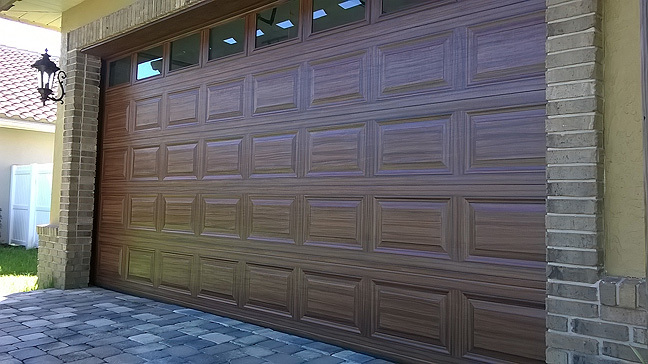 The following pictures are of the finished garage doors. 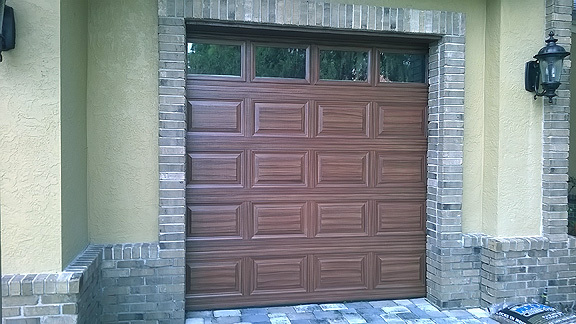 I painted these garage doors to look like a mahogany wood so they would match the front door. When you turn in the driveway you can see both garage doors and the front door and they all now look like the same wood. I love the tone of this color. This one is by far my favorite of all the ones you have done!! Great inspiration. All the colors I used are Sherwin William's. 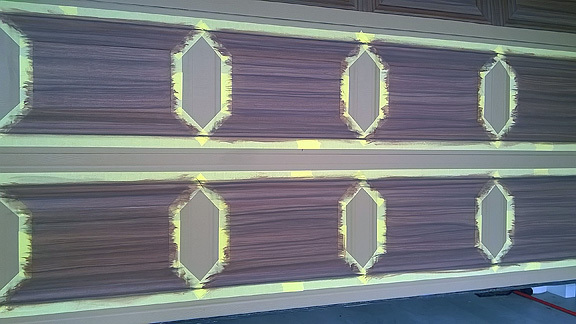 The base coat color is Toasty, the first color of brown is Fiery brown and the second and darker color brown is Black Bean. Rick, you really do not end up seeing any tape lines and the main reason is because when paint in the wood grain the paint is thinned down a lot. Do not use gel stain. It will start to crack and peel in less than a year. Any oil based product will crack and peel in short order. I can generally paint a standard double door (which is 4 rows high) in 3-4 days working about 6-7 hours a day. You will notice that the garage doors on this page are 5 rows high so it took 4 full days to do the big one even with the windows. Hope this helps.